I had been involved in youth ministry for ten years when a need opened up in children's ministry at SDBC. I had never served in children's ministry and felt unqualified but saw the need and felt called to step in. Sometimes we may think, "I'm not at kid person," "I'm not a teacher," or "I'm not sure I would be good at it," and those were my thoughts. But, I trusted that if God was calling me to this, He would equip me. This eventually led me to serve on Sunday mornings as a coach/teacher for our elementary group leaders. I found a passion for leading not only the children in the ministry, but for our volunteers as well. Little did I know that God would use that to prepare me for another need in SDBC Kids. Again, I felt unqualified but the need was there and I stepped out in faith. I trusted that God was calling me to use the gifts He had given me in this ministry as the children's ministry coordinator. My role as the ministry coordinator is to work alongside our volunteers, providing them with their curriculum and the necessary supplies for their activities, and being a support for them on Sunday mornings. It is such a blessing to have the opportunity to serve the kids of SDBC in this ministry, as every week I see the kids grow in their knowledge and understanding of the bible and God's plan for them. There is nothing better than being a part of that moment when kids finally understand the gospel message. - childcare for Women in the Word (Wednesday mornings). 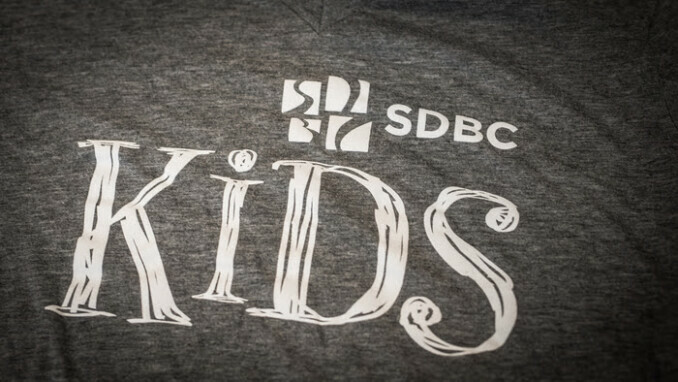 If you would like to serve alongside us in SDBC Kids, or if you have any questions, please stop by the Spotlight Table in the foyer this Sunday or email us at . We'd love to meet with you!